The selfiecity project has launched earlier this week, and boy, it has hit a nerve. We had 10’000s of visitors in the first few days, and hundreds of articles and posts linking to the project. It has been a great pleasure and stimulation to work with an exceptionally interesting team on this: from Lev Manovich (a legend in the media theory and digital humanities scene) over my brilliant — and, luckily, by now, frequent — collaborator Dominikus Baur to Daniel Goddemeyer, Mehrdad Yazdani and many other talented folks. The project investigates a seemingly mundane topic — selfies (#omg #wtf). Of course, the topic has been a big hype for the last few months, and was even Oxford Dictionaries’ word of the year. If you search for selfie on Google Images, your worst expectations are confirmed – bikini blondes, duckfaces — all the clichés you would expect. However, we were wondering – is this an accurate view of this phenomenon? Or are today’s self-portraits maybe a bit more multi-layered and interesting than the buzzfeeds and daily mails of the world make us believe? We think that such complex cultural phenomena can only be investigated with a mix of techniques, ranging from theory over quantitive analysis to visualization and artistic expression. The interactive selfiexploratory allows you to navigate the whole set of 3200 photos from five cities from around the world (indeed, elastic lists inspired, but in a shiny new HTML5 armor, thanks to Dominikus!). We also present new findings about the demographics of people taking selfies, their poses and expressions. 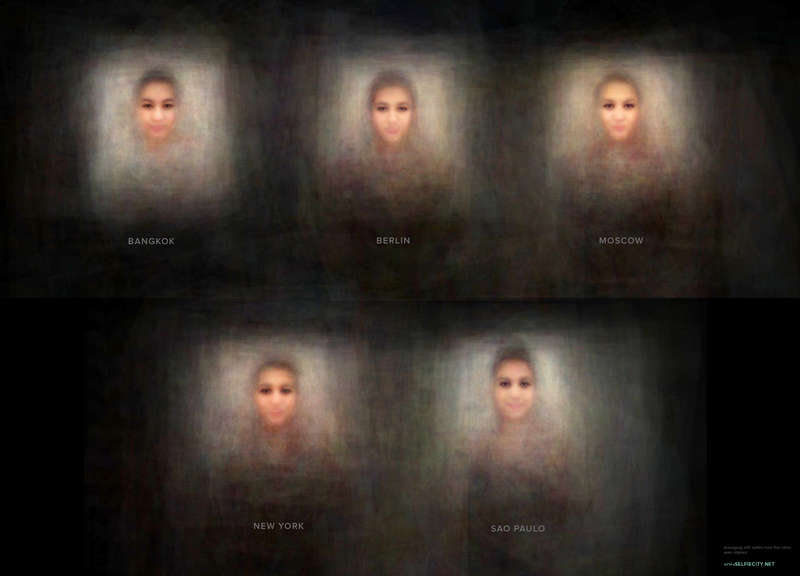 Video montages assemble hundreds of images into a dynamic, morphing “aggregate city face”. And finally, theoretical essays essays discuss selfies in the history of photography, the functions of images in social media. Why so many components? Like a well-composed dish, all of these components are consumable and interesting on their own, but, the real experience only emerges in the combination and the interplay of these elements. The data collection was actually one of the biggest efforts in the project. In short, we pulled data from gnip, and combined multiple layers of human inspection and automatic analysis, but finding the right way to do this was a long process. From a data visualization point of view, our biggest challenge was to find forms of summarization that show the high level patterns in the data — the big picture — but still respect the individuals, and don’t strip away all the interesting details. 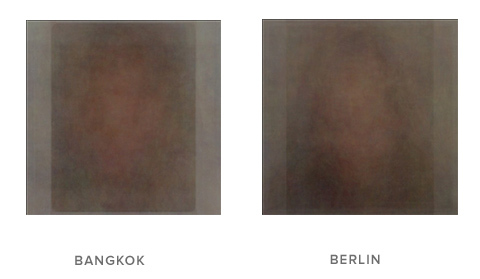 256 images from each cities, eyes aligned. Each drawn with 1/256 opacity. Note how the averaging algorithm introduces a Virgin Mary look – an aggregation artefact. Or, in other words – the sum of selfies does not look like a selfie. Go figure. In a way, an our dataset is fractal: The closer you look at a single selfie, the more details you can discover, discuss and analyse. Which also means, we did not really visualize 3’200 “data points” (whatever that means, anyways, …). We actually tried to make 3’200 little worlds explorable. One thing I love and hate about these projects is how intermingled the questions and answers about people, media and algorithms are: Is this a project about selfies? Or about instagram? About the people in the cities? About automatic face analysis? About mechanical turk? About social media? Somehow, all of these, but none exclusively. Consequently, all of our findings have to be taken with a grain of salt: for instance, on our selfies, Bangkok women seem to be the youngest. This could have many reasons: maybe, more younger people use mobiles in Bangkok? 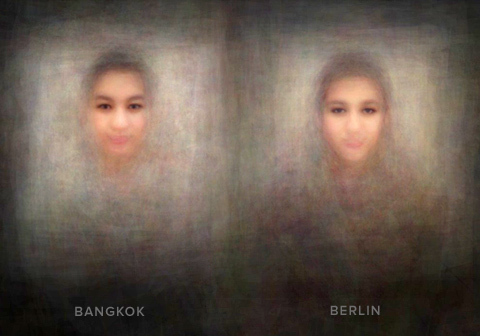 Maybe, the average Mechanical Turk worker misjudges women from Bangkok to look younger? Maybe, it is just that Instagram is more popular for young people in Bangkok, while the older ones post a lot of selfies on other platforms? All of this is hard to untangle. Nevertheless, I strongly believe, that some information is better than no information. Just — always be aware of the biases in the data collection; always be questioning the data! Of course, the factoids were not really the thing we were ultimately after. They help to trigger curiosity, and provide simple take-aways to remember. Yet, our real goal was to provide a structured way to explore a complex phenomenon on your own terms, in a sensually rich mosaic of media and facts — rather than just ready-made deep-fried bite-sized info-snacks. Selfiecity: The findings of the project | notbl.